At least two of the four law enforcement agencies that were deployed in Ferguson up until Thursday evening — the St. Louis County Police Department and the St. Louis Metropolitan Police Department — received training from Israeli security forces in recent years. It all started when a yet to be named Ferguson police officer killed Michael Brown, an unarmed black teenager. According to witnesses, Brown was attempting to surrender with his hands up when a Ferguson police officer emptied his clip into Brown’s body, shooting the teen up to ten times. 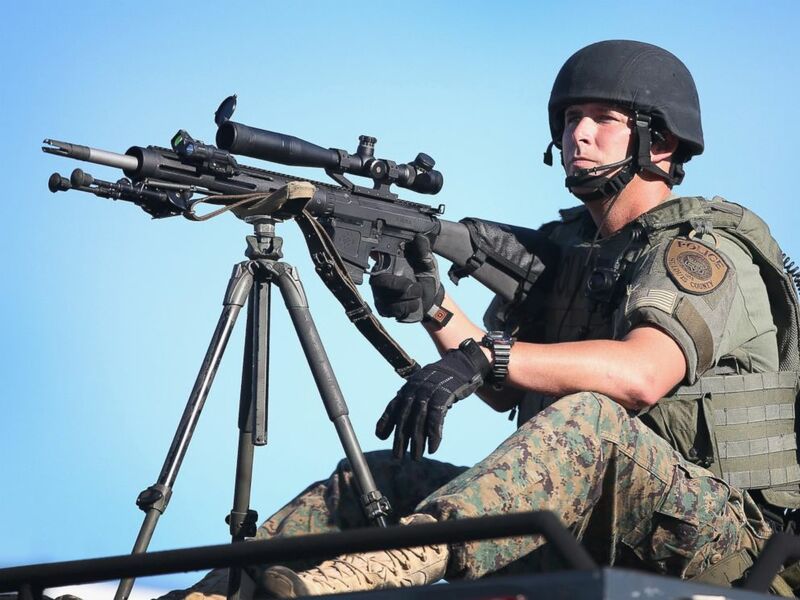 But the widespread militarization on display in Ferguson is part of a more recent trend that began three decades ago with the introduction of the disastrous “war on drugs” and dramatically escalated with the “war on terror” — leading directly to the counterinsurgency-like tactics deployed against the people of Ferguson by civilian police officers who more closely resemble combat soldiers in Afghanistan than domestic cops. Former St. Louis Metropolitan Police Department police chief Joseph Mokwa is listed as having traveled to Israel as part of a LEEP conference in February 2008. Following nationwide outrage and embarrassment, Missouri Governor Jay Nixon pulled St. Louis County Police forces out of Ferguson and placed the Missouri Highway Patrol in charge of policing demonstrators. The St. Louis Metropolitan Police Department voluntarily removed its officers from Ferguson. Editor’s note: An earlier version of this piece referred to the St. Louis Police Department. It has since been updated to identify it as the St. Louis Metropolitan Police Department. Responding to a question at a press conference yesterday about who is in charge of tear gas deployment, Ferguson police chief said, “Sometimes it’s highway patrol, St. Louis County, us, St. Louis City.” So it appears that St. Louis (City) Police were deployed in some capacity in Ferguson. Israel-trained police "occupy" Missouri after killing of black..
Why do you provide misinformation to this article rather than deal with the substance of the article, which is about further Zionists obstruction of American Democracy ? Your reach impugns an attack on the credibility of the author/substance of the article, which is the tactics of Zionist war-crimes against the imprisoned people of Palestine being marketed to U.S. police forces for use against our non-violent attempts to make our government representative accountable. The St. Louis Police Officers Association on Friday blasted city Police Chief Sam Dotson's comments to the Post-Dispatch saying he did not support St. Louis County Police's Department's tactics in Ferguson. Dotson said he stopped sending officers to help county police after Monday night he didn't want to "put officers in situations that I would not do myself." Why would the United States allow Israel, of all people, to train out domestic police forces? Who is responsible for that? Is there a formal agreement that promotes this absurdity? Do we pay the Israeli military to train our local police? Have we lost our everblooming minds? I have the same quistions. Is there anybody out there who have the documentation on it? Thou I think I have read something about in the past. There is a disorder in the consciousness of America which sees Israel's application of violence over the years as a product of genius rather than as a chronic failure to get along with neighbors. An interesting tidbit is that the Israeli police general who is in charge of the program has a son who is a member of Anarchists Against the Wall. Shlomo Efrati is the dad and Eran Efrati is the son blowing the whistle on him. Can you please link to anything that have this documented? You better start there and check out the meaning behind the Balfour Declaration. Israel owned the USA before they even existed. Not only law enforcement training is outsorced to Israel. Even the backbone of phone communications and internet is owned by an Israeli company. It even made news when the Israeli company was caught giving the cell phone information of secret service members to the Israeli Mafia. Zionism is the elephant in the middle of the room that most people do not want to talk about for fear of being labeled anti-Semitic. This is an important and timely report. The militarization of American policing should be of concern to everyone. For more than a century- arguably, since the Civil War- the United States has been continuously at war. This has produced a flourishing and deadly military culture which we're seeing at toxic levels in the streets of American cities and towns. The forging of close ties between stateside racist police forces and the Israeli occupation of Palestine offers a perfect symbiosis of repression. People sometimes wonder why key institutions in the United States are so committed to the Zionist cause. The Israel-based police training exposed in this article is one factor. American cops, never sympathetic to the problems of black and brown neighborhoods, now look on residents of these areas very much as the IDF regard Palestinians under occupation. The increasing brutality and the storming show of military weaponry put on by today's police have their roots not just in US history, but in the racial politics of Israel. And we ought to remember, police forces represent the State in a direct form. Where you have this kind of intimidation and mechanized violence, you have a government behind it, funding, teaching and rewarding such misrule. If there's one feature of policing germane to this discussion, it's that police departments are very conservative institutions. They seldom innovate, but take their direction from the nature of the state they serve. And that's an extremely violent military state with no regard for the rights of common people. Don't believe everything mainstream media tells you...Hint: who owns mainstream media...Plus US gives Israel 2 billion a year..
None of this is surprising. Israel was instrumental in training soldiers, selling weapons, and sending military personnel to both Namibia and South Africa to maintain the racist apartheid regimes there. What they are doing by training officers here is the same. The majority of all officers in the US are white. Those not white are hired to be Uncle Toms they can depend on. We have a racist , class bias apartheid regime here. As the economy worsens, already 38% of the working age population doesn't work, the 1% will need repressive measures to maintain absolute power. Hence the reason for hiring the most brutal racist army in the world to train our officers. It's already too late...trust me. Since when did an 18 year old man become a "young boy?" This sentiment biased concept seems to permeate even news media. Brown was a young man. 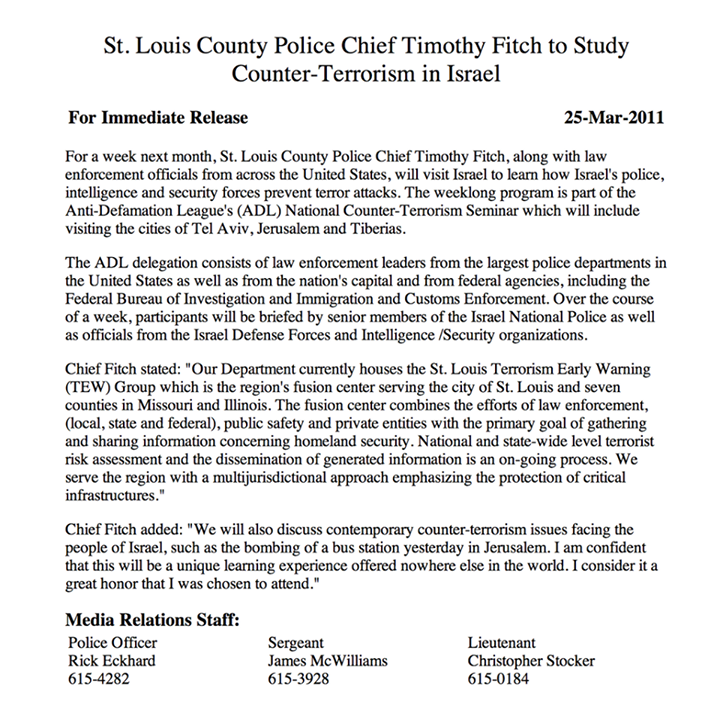 "...the St. Louis County Police Department and the St. Louis Police Department — received training from Israeli security forces in recent years." Does anybody have a source on this? Just google it. The information is all over the web. The NYC police also received training from the Israelis. That came out during the Occupy police reactions. Dutch nonagenarian recently returned Righteous Among the Nations medal after six relatives killed in Gaza. Henk Zanoli, who helped save a Jewish child from deportation to concentration camps, said holding on to the medal would be an 'insult to the family.' He said, "For me to hold on to the honor granted by the State of Israel, under these circumstances, will be both an insult to the memory of my courageous mother who risked her life and that of her children fighting against suppression and for the preservation of human life." It doesn’t make you anti-Semitic, racist or a self-hating Jew to disagree with what Israel is doing, just a person with compassion, a good heart and a conscience. That article is a first page piece in the NY Times. I was very glad to see this gentleman speak out against the actions of Israel. As far as I could tell, Rania Khalek only showed that two former STL city/county police chiefs had attended week-long training seminars in Israel. One was the former chief of the city of St Louis police department, which had minimal involvement in the Ferguson crackdown (see first comment). Hence, the connection between the Ferguson crackdown and Israel is tenuous at best. You can minimize and lie but you cannot disguise the truth. It's a fact that many American police forces receive "free" trips and training in "anti-terrorism tactics" in Israel, paid for, of course, by the money the American taxpayer is forced to give to Israel. Google it. This is no place for hasbara propaganda. The alakhbar article and ADL page below document trips to Israel for training of US police leaders. ADL page for the program describes quotes US police leaders recounting specific techniques taught in the programs. When researching Israel-US correspondence in police training, the motherjones article is a main landmark. But the discredited Greenberg quote you mentioned speaks not to anti-terrorism tactics relevant to Ferguson and the West Bank but rather to torture techniques, and their origin, in the US occupation of Iraq. We ain't see nothing yet, wait for worse since our government support this most brutal army of Israel and they occupy our senate and congress as their territory. And they are training our police force, just asked people who went israel how they police and army humiliate people there, where is our dignity folks. And people are suffering here in America. Wake up America. In addition to the training of US police in brutal tactics, the politicians especially the neocon Republicans have been influenced to build separation walls between US/Mecico border not unlike the Jerusalem/West Bank wall. "Why can't we all just get along"!